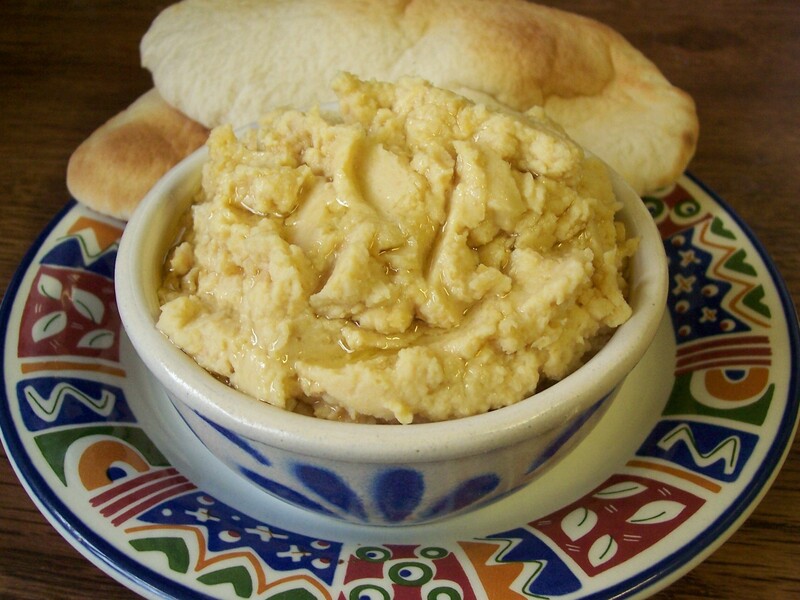 This basic Hummous (or Hummus, there are various spellings) mixture can be served as a snack, a starter or appetiser or as part of a buffet. Traditionally Hummous contains tahini, a sesame seed based based paste, but as long as the sesame flavour is present the finished Hummous is, I find, indistinguishable. I add the flavour by either adding ground toasted sesame seeds or, more usually (because it is easier) sesame oil, which is always in my cupboard. Hummous is a vegetarian dish, but much loved by the members of our household, who are all non-vegetarians. 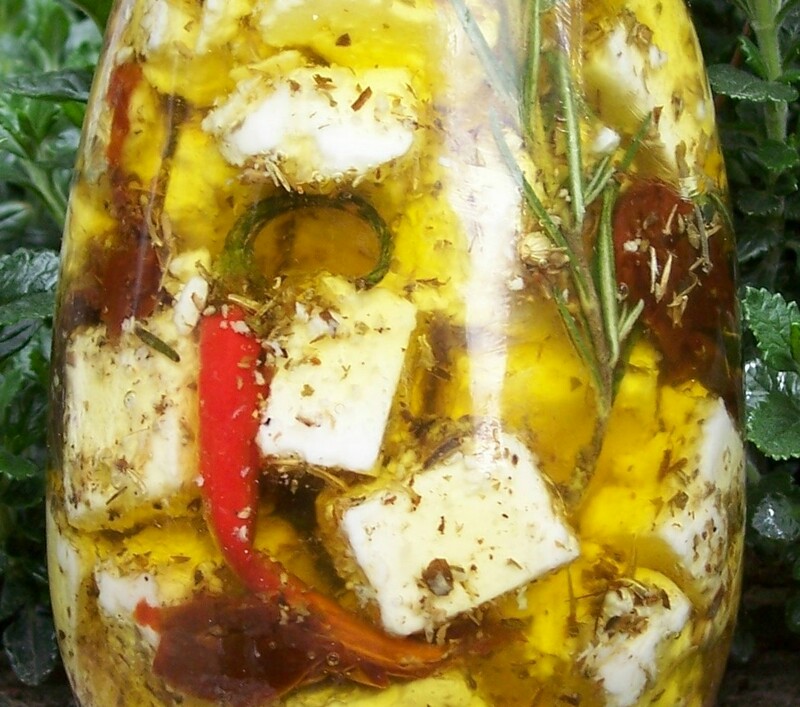 It is a quick and easy recipe and very useful as it can be made in under 10 minutes. The original recipe for Red Pesto Hummous was pulled from a magazine advertising Flora products, but this is my own variation of what seemed a very good idea! The pesto Hummous is equally as delicious made with green pesto and both could be put on a buffet table side by side: just add half of each colour of pesto to each half of the blended chickpea mixture. For extra flavour I added 2tbsp toasted crushed (or ground) sesame seeds to the original recipe (sesame is a traditional ingredient in Hummous), plus a pinch of salt, although these could be omitted. Alternatively the mixture could be blended with sesame oil in place of the half fat spread, in which case the seeds can be omitted. 1. Put all the ingredients, apart from those added when serving, together in a food processor and blend. The texture can be either chunky or smoother depending on the length of processing time. 2. 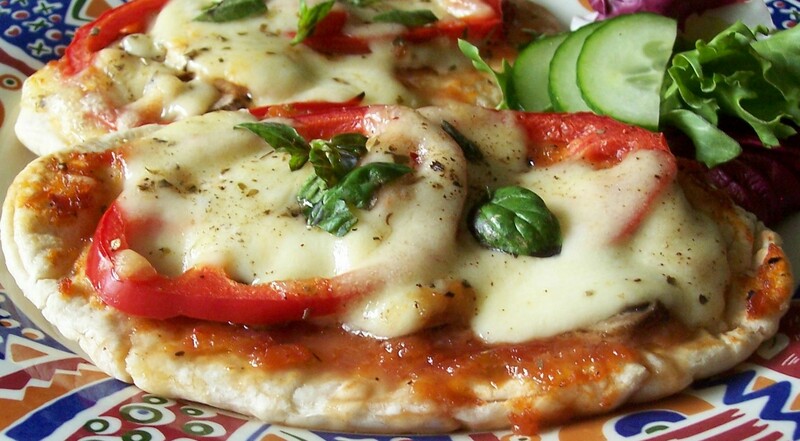 Serve with toast or pieces of warm pitta bread. It can also be used as a dip at a buffet with a selection of crudities: sticks of carrot, cucumber & peppers plus bread sticks. 1. If making two different colours put all the ingredients, apart from those added when serving and the pesto, together in a food processor and blend. 2. Divide the mixture in half and add ½tbsp of each colour to each half of the basic mixture. Welsh Rarebit is a traditional British dish. It was recorded in an eighteenth century recipe book having been served as a supper or of snack food in taverns and alehouses. It is not clear why it has the name Welsh, which was first recorded in 1725. However it has been suggested that cheese was cheaper than the meat which the impoverished Welsh people of that time could not afford to eat. Some traditional versions add a splash of Worcester Sauce, ale or mustard to the mixture as it is mixed for extra flavour. Also a pinch of cayenne can be sprinkled on top. I have a Welsh Recipe Tea Towel, which includes one for Welsh Rarebit (called Caws-Wedi-Pobi in the Welsh language). The ingredients are 8ozs/225g cheese, 1tsp butter, 1tsp dry mustard, 2tsp Worcester Sauce and 2tsp flour mixed with 4tbsp milk or beer which are melted together in a saucepan before being spread onto 4 slices of toast and finished under the grill – a parsley garnish is suggested: so a much more complicated and highly flavoured version than mine below. Buck Rarebit has a poached egg served on top. This is the way Welsh Rarebit is cooked by my mother but I think the recipe is a fairly standard one. 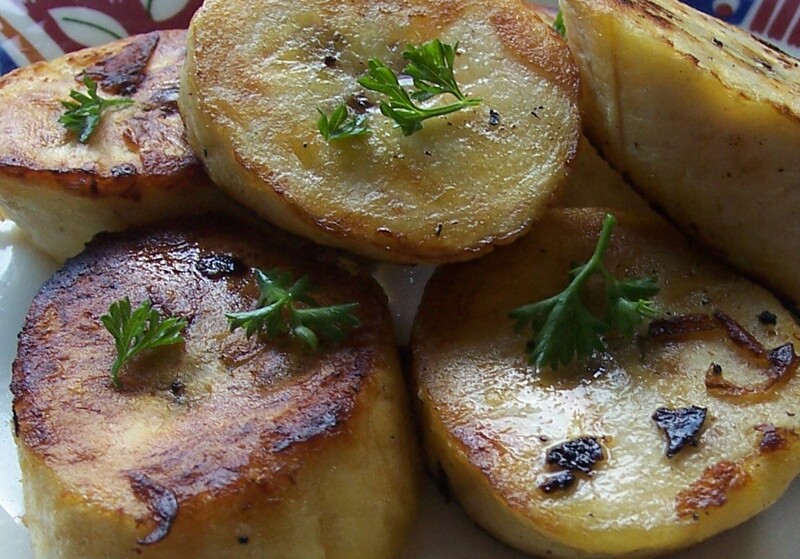 It is one of the simplest cooked lunch dishes I know and very popular with my family. In some ways it reminds me of a very simple version of Nigella Lawson’s Triple Cheese & Onion Strata, especially if I put a little more effort in when making it and add some fried onions, which make it delicious. I have tried to give an idea of the quantities of ingredients, but mostly I do not weight what I use. It is a good way to finish up the remains of a block of cheese and different types of cheese can be combined although it is usual to use hard rather than soft cheese. Mostly a fairly strong cheddar or similar is recommended, but a milder flavour is fine if it is preferred. A delicious addition is to spread the bread with some home made Tomato Relish or another relish or chutney – or even a scrape of Marmite (love it or hate it?) before grilling. My family have been known to add a dollop of tomato sauce onto the finished rarebit, though I prefer it without. However, the recipe given below is for my usual everyday version with no frills, apart from those I am likely to include. The mixture can be made a little in advance and stored in the fridge. 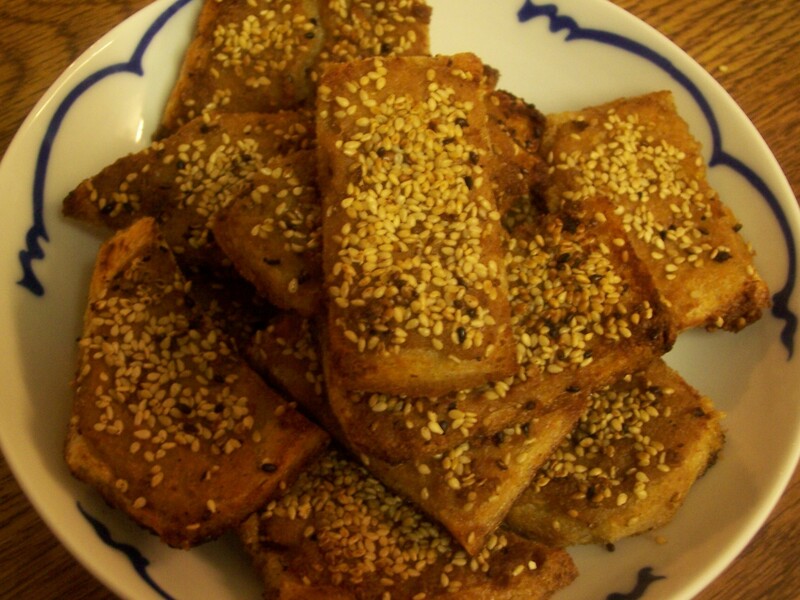 It is usually eaten hot, but there is no reason why it could not be eaten cold. Cheese on Toast is an even simpler version of this recipe and too simple to be a stand alone post. 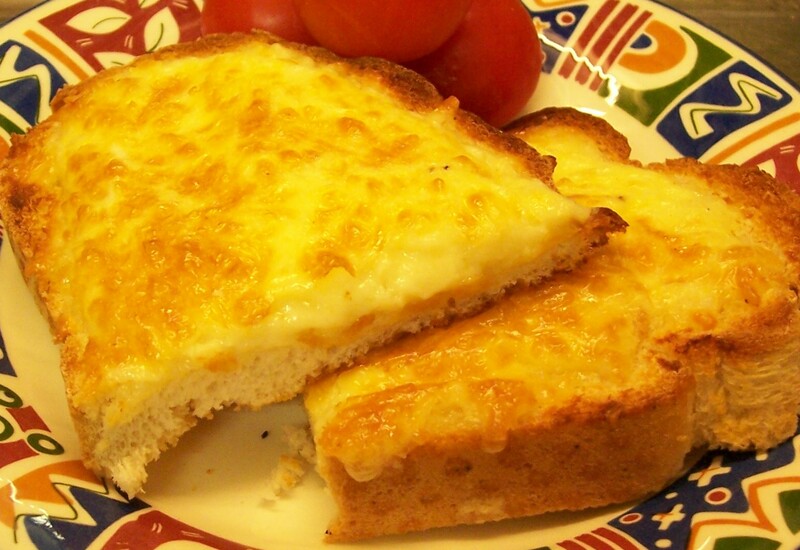 It is quite literally cheese-on-toast: sliced (or grated) cheese, arranged on the untoasted side of a slice of bread and then gently grilled until golden and bubbling. 1. Break the eggs into a bowl and stir with a fork. 2. Stir in the grated cheese. Add the pre-fried onions at this point if using. Season and mix together well. 3. Toast the slices of bread on one side only. If using relish, spread this over the untoasted side of the bread. 4. Share the egg and cheese mixture equally between the four slices of bread, piling onto the untoasted side (on top of any relish if it has been spread on). Gently spread over the slice but not quite to the edges as the mixture will melt and spread out slightly. It can be gently spread more with a knife while cooking if necessary. 5. Sprinkle over the cayenne, if using. Cook under a gentle grill until the mixture has melted and browned. Do not cook too high or the crust will burn before the centre is cooked. 6. 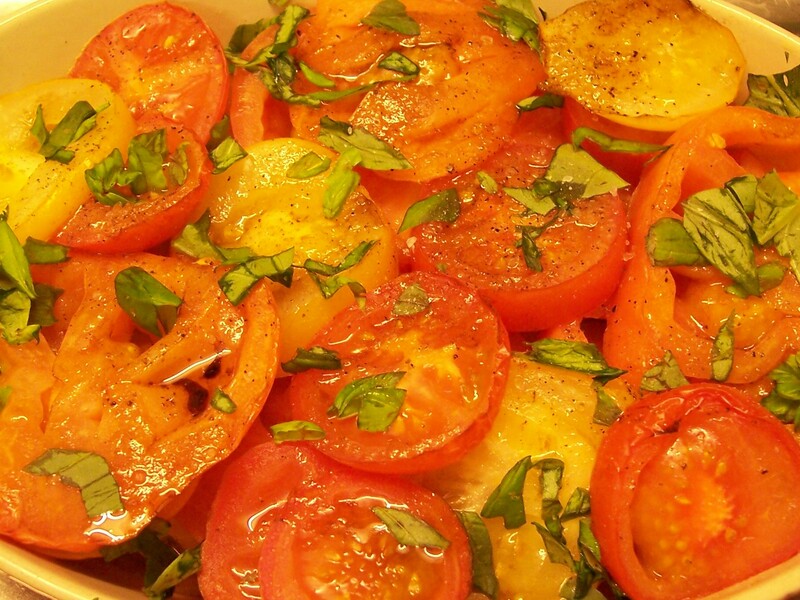 Cut into half, or slices and serve with a small side salad while still hot. 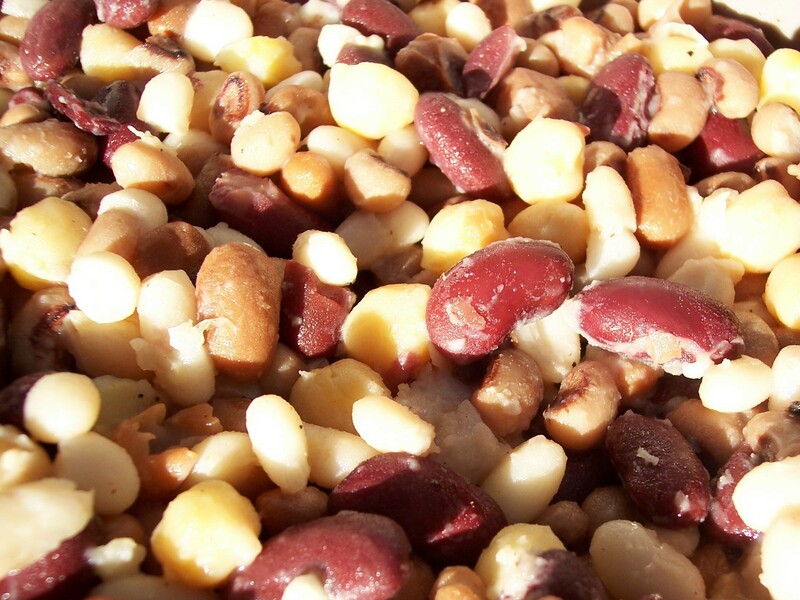 The soft cream, beige, brown and maroon colours of a mixed bean salad is attractive and delicious addition as part of a summer salad meal and a useful dish to serve on a buffet table. I tend to make a large potful and keep it in the fridge to eat over several days – but I find it rather ‘moreish’ and it is very difficult not to help myself to a quick spoonful every time I open the door! 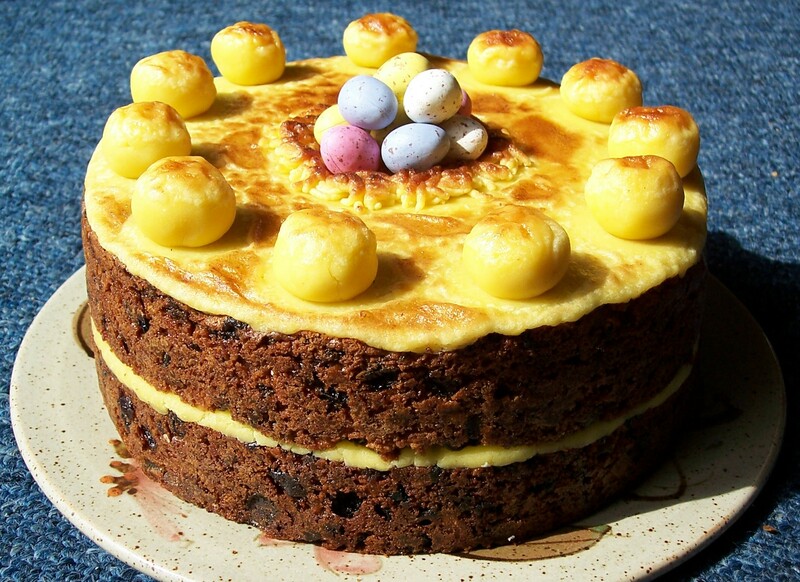 These recipes come from Vegetarian Kitchen by Sarah Brown, the book of her BBC TV series from the 1980s. I first made these marinade recipes not long after seeing the series and buying the book and I find it difficult to decide which is my favourite, so I have posted both. Mixed dried beans can be bought and cook them in advance, in which case about an hour needs to be added to the preparation time. I find, however, that the beans often end up looking a similar colour, losing the individual shades which go to make the salad rather pretty. The best way to avoid this is to use tins of pre-cooked beans, gently warming them through first to help soak up the flavours of the chosen marinade. It used to be much more economical to buy and cook dried beans, but tinned beans are much less expensive now, especially if bought from the ethnic food aisle or from the supermarket’s ‘economy’ range. Both marinades look virtually the same: as for flavour, the ‘Dark & Spicy’ is actually not very hot (increase the proportions if you wish after you have given it a try) the ‘Light & Sharp’ is a fragrant mixture of lemon, garlic and ginger. I usually make this second one for entertaining. Any leftovers keep well in the fridge and can be eaten over two or three days if necessary – if there is any left. 4. Cover and leave in a cool place, transferring to the fridge if possible once cold, to allow the flavours to permeate the beans. Ideally do this overnight or at least for severall hours. 5. Just before serving chopped parsley can be sprinkled over the salad to add extra colour – for the Dark & Spicy marinaded beans chopped fresh coriander can be substituted. 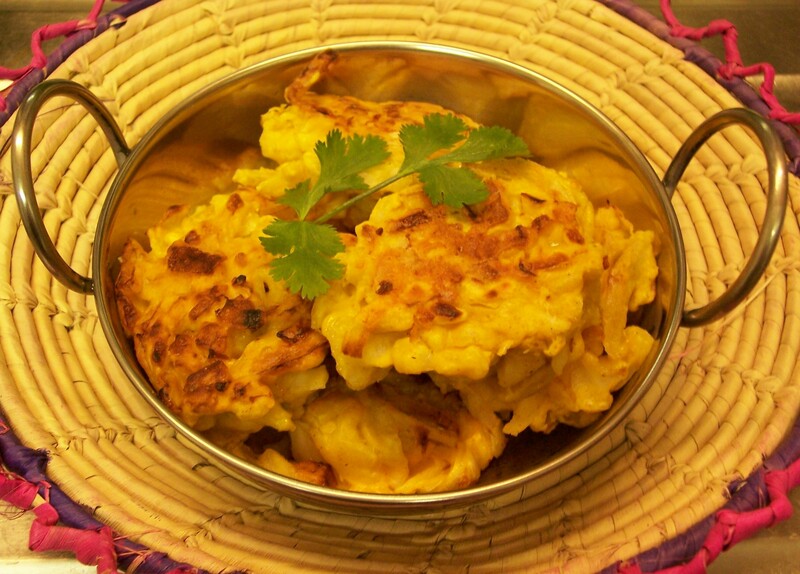 Crisp outside, spicy and soft inside, Onion Bhajis are delicious: fried onions with a twist. When we visit an Indian restaurant it is not unusual for all of us to order them as a starter or to accompany the main course. I have seen packets of ready mix in supermarkets and local ethnic shops, but I hadn’t realised just how easy they were to make until I found this recipe: simply spoonfuls of fried, spicy diced onion and chick pea (besan/gram) flour batter mixture. I shall definitely be making these now when I serve Indian style food to friends. The recipe comes from a library book Curry: Easy Recipes for all your favourites by Sunil Vijayakar, which has a good selection of uncomplicated sounding recipes. It is better if the onion is chopped fairly finely (but not very finely) and the batter quite thick so that the mixture does not easily fall apart when being cooked. I also found that putting the mixture in the fridge to chill for a while helped them to hold together, a bit like Salt Fish Cakes. In fact the method is not dissimilar. The original recipe calls for deep frying (in sunflower oil heated to 180oC for 1-2 minutes) but I found that they could be shallow fried just as easily, which is a (slightly) healthier option. Make them fairly close to serving to keep their crispness, but they could be kept warm for a short while. Serve either as a first course accompanied with Lime Pickle and/or Mango Chutney or as one of the vegetable options in a mixed Indian style menu. Chopped fresh coriander to serve, if available. 1. Mix the gram flour, chilli powder, turmeric, coriander seeds and a pinch of salt together in a bowl. 2. Add water to make a thick batter, which will hold the onion together. 3. Stir in the onions and curry leaves. If necessary add a little more flour. 4. Form the mixture into balls, using a little flour on the hands and surface to stop them sticking too much. Put them in the fridge to chill for at least 10minutes. 5. Shallow fry in sunflower oil until golden brown. 6. Serve garnished with some chopped fresh coriander if available and Lime Pickle and/or Mango chutney for a first course. This recipe evolved from some experimentation when I wanted to make some corn fritters to serve with Chicken Gumbo, although it was not difficult to work out a satisfactory recipe. I wanted a fritter that involved shallow frying using a minimum of oil, rather than a calorie laden deep fried version. (I do not own a deep fat fryer.) After a little experimentation, this is the recipe I came up with, using my basic batter recipe as used for Yorkshire puddings. It is very simple to make and can be eaten in place of, or as well as, rice. Cayenne pepper, adjusted to suit your taste, gives a spicy ‘kick’ to the fritter. If you want something hotter, try using de-seeded and finely diced chilli peppers in place of the Cayenne. Sweetcorn pancakes/fritters can be found in both Caribbean and Southern USA cuisine, so I often serve the pancake fritters as a side dish with Chicken Gumbo or Hyacinth’s Salt Fish Cakes and alongside Fried Plantain, which is added towards the end of the cooking time using the same pan. 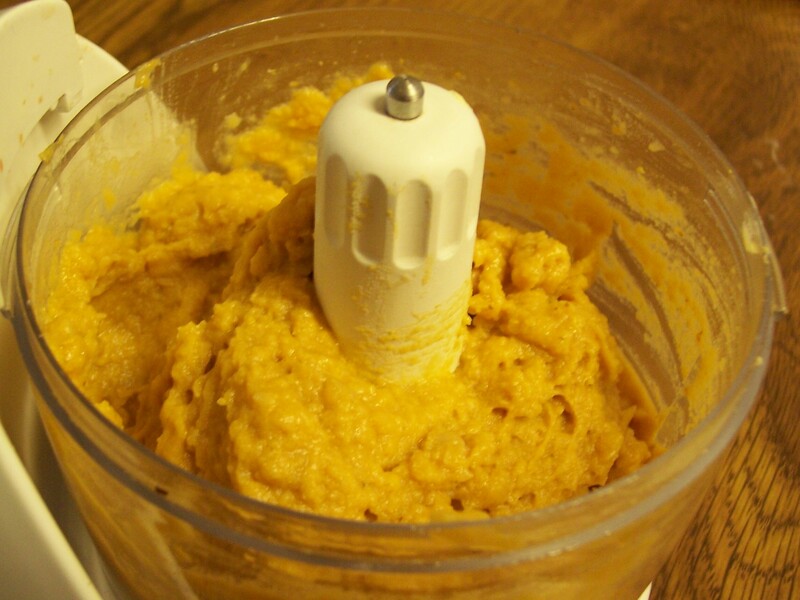 Alternatively the plantain could be diced and added to the fritter mixture. More ideas on how to vary the dish to eat at other meals are given after the recipe. 1. Make the batter mixture and beat well. If made ahead of time store in the fridge without adding the other ingredients. 2. When you are ready to cook the fritters, beat the mixture well again and add the spring onions, corn and seasonings. 3. Heat the oil and spoon in 1½ to 2 tbsp per fritter, cooking several fritters at one time, depending on the size of your pan. It is better to have thinner smaller fritters which cook through to the centre. Use a medium heat, flattening each with a spatula. Avoid turning the fritters over too quickly, but when a fritter is golden on one side flip it and brown the second side. Watch carefully as they can burn quickly. 4. Absorb excess oil by placing each batch between layers of kitchen paper and keep warm until needed. 5. Serve as an accompaniment to a Southern USA or Caribbean Style dish, alongside rice and shallow fried plantain, or with a boiled ham or gammon joint. They would also be good served alongside some crispy bacon and/or eggs and grilled tomato as part of a brunch breakfast. Vegetarian Variation: Add grated cheese and pre-cooked potato, parsnip or sweet potato and eat these fritters as part of a vegetarian lunch. 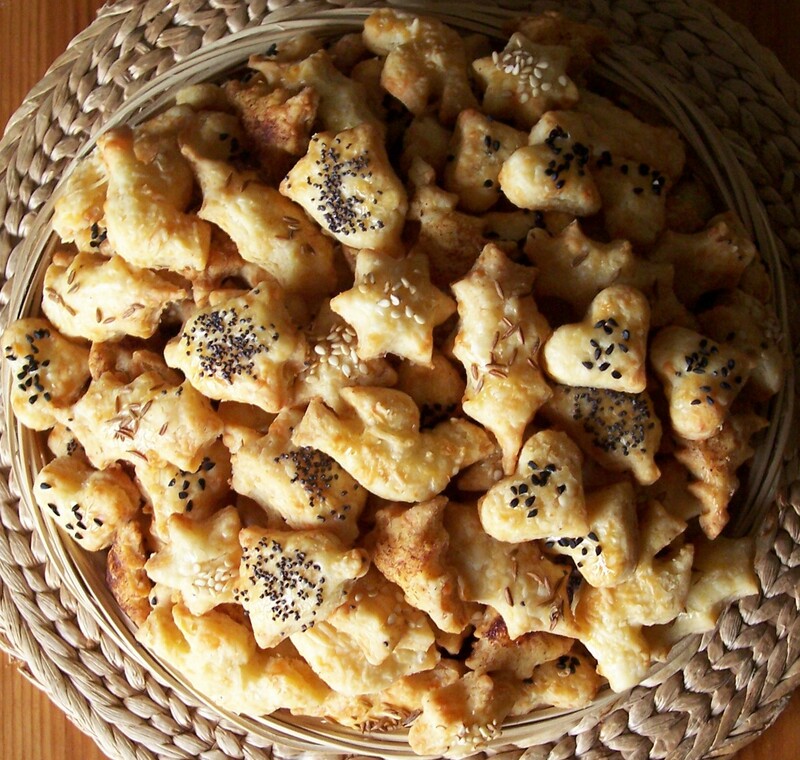 They could also be eaten cold as part of a picnic in the original or cheesy vegetarian version. I learned how to make fried plantain by following instructions given by a friend from the Caribbean. It’s such an easy recipe you might wonder why it is here, nevertheless I think it is worth recording. Plantain is still fairly new and may be unfamiliar to some people: I had to find out how to cook it! Although they are the same family, Plantain differ from the yellow dessert bananas usually found in the fruit bowl. Plantain can be bought from Caribbean food stockists and can also be found in larger supermarkets. They are usually best bought while still green, without too many brown spots, so they can be stored in the fridge for a few days if necessary. The skins can be a little difficult to remove. When you are about to cook them, using a sharp knife carefull slit the skin lengthwise and then carefully peel away the skin. 1. Cut the plantain into 1cm/½ inch pieces, either straight or diagonally. 2. Heat the butter and oil together in a frying pan. 3. Reduce temperature and gently cook pieces of plantain in batches, turning as necessary until golden brown on both sides. Be careful as the sugar content will make the plantain pieces caramelise and burn quickly. 4. As each piece is browned lift out and place on kitchen paper to remove excess oil. Keep warm until all pieces are cooked. 5. Serve as a side dish for Caribbean dishes. A parsley garnish looks pretty!